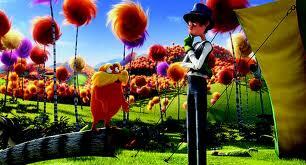 The Lorax is an awesome movie. Now, maybe it's because this is the only movie I've seen all year (I think I saw two movies in the whole of 2011...I don't get out much anymore), or maybe my tastes have muted, having been subjected to hours of Dora and Max and Ruby...but, really, kids' movies just keep getting better and better, don't you think? I would confidently say that any kids' movie released in the past five or ten years is better than any adult comedy. There's such an art to making movies, and kids' movies especially, because they have to span the entire audience. The writers have to engage not only the kids for whom the movie is intended (and try engaging a three year old for an hour and a half...it's not easy), but also the weary parents dragging their kids there, or the well-intended grandparents who want to do something nice with the children and probably need a break from "my favorite game is asking you a billion non-stop questions." The movie-makers find themselves having to span generations of different experience and amusement levels, and they do it. Adding adult jokes and content to kids' entertainment isn't new by any means, but if you ask me, they're perfecting the art, and each movie that comes out is better than the last. Tangled probably topping that list. It must be so hard to write stories like this, or even (in the case of many movies these days, kids' and adults' alike) rewrite them. To capture imaginations across the board. Having now tried to write fiction myself, I appreciate each line of dialogue and each fitting theme. I'm about as lyrical as a foot, so seeing people do this for a living the way I did news, like, 'hey, no big deal, just writing up an awesome movie,' well, it's awe-inspiring to me. And after all, dear, what is idle prattle for? It's she who holds her tongue who gets her man." The Once-ler's big number isn't quite as witty lyrically, but it's still a smash as far as I'm concerned. How can you not love this deliciously creepy song? I don't know how bad he could be, but after seeing this scene (not pictured because none of the film is out there yet, and if it were, this would be a spoiler anyway), I wouldn't mind finding out. The interpretation of the Once-ler is genius. He's probably one of the best-written villains out there, being given a boost by the fact that the writers had to make most of him up, tying greed in with innocence, knowing destruction with good-heartedness. A very tough blend, though, of course, they had help from the hints left by Dr. Seuss. Here's an excellent post all about the making of the new Once-ler. Nowhere anywhere can I find a picture of him in his Once-ler duds, so I guess you'll have to go see the movie. It's worth it, really. Even with a squirmy three year old on your lap. Oh! I do have one complaint. If you want to watch a movie in peace in the theater, how about you don't go to the matinee showing of The Lorax, k? Geez, people. Who else did you expect to be there? Of course it was going to be a preschool. If you like this blog, please vote for it here at Babble's Top 100 Blogs list. 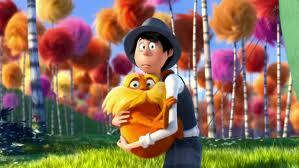 "If you want to watch a movie in peace in the theater, how about you don't go to the matinee showing of The Lorax"
I used to roll my eyes at these sorts even before I had kids. Dude, we're sitting in a theater for a kids' movie. Who else did you think was going to be present? Moment of the Week - 82: Surprise Naps!